Project Roots was born out of what seemed like a simple effort 7 years ago. In an attempt to provide consistency and planning across all group classes of the day at CrossFit Roots, Shane Upchurch and I began to trade off writing a WOD Plan for every class. Whoever was teaching the first class of the following day was responsible to write the WOD Plan by 6pm the evening before and send it out via email. They provide the expectations for each coach and help your affiliate deliver a consistent product. They help teach coaches how to effectively run a group class with timelines that work. They enable members to get the best use of their time by giving them all the pieces necessary for a single workout and long-term development. They enable the affiliate to take a longer-term view and build in progressive skill work and benchmark testing. While they are one of the reasons for affiliate success, it does not come without a significant amount of investment (time) on the staff. Seven years into WOD Plans, and it turns out it’s a ton of work for an affiliate (i.e., small business) to produce that amount of content on a monthly basis. While sitting in the back office one day, we added up the hours our team contributes to our affiliate and Project Roots. What does it take to make WOD Plans for our affiliate, and ultimately, Project Roots happen? The design, layout, and tweaks for group class programming for one month. Mike Cerbus’ time writing the Olympic Weightlifting component for the Competitor Program, and EC and Dave’s additional work for this population trains more than one workout a day. The design, testing, and filming of the monthly Skill Work included weekly in the daily WOD Plans. After the above is created, we review it all for one hour and make sure we haven’t missed or overlooked a component of the program’s goals or integration of pieces like the yearly benchmark series. Six coaches write the month of WOD Plans, each contributing 2-5 plans per month. The plans are designed and written by each coach who incorporates their own personality and style into warm-ups, video links, progressions, scaling, and modifications to name a few. This provides a built in level of variance since we all have biases, no matter how unbiased we try to be! All of the GPP class programming, Skill Work, and Competitor Add-on workouts are loaded into SugarWOD such that they automatically deliver to Project Roots affiliates and athletes. Every WOD Plan is made available in the Coaches Notes of Project Roots. 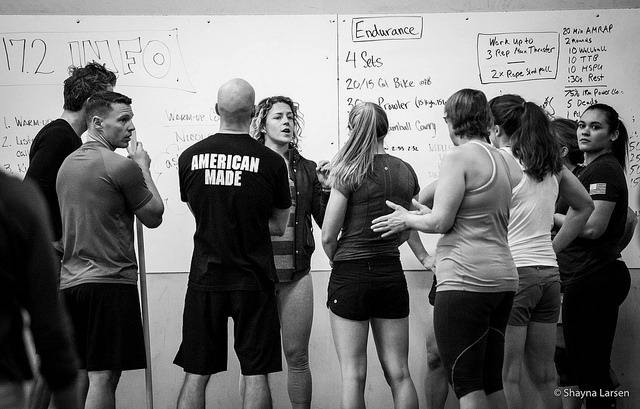 The coaches are assigned to write WOD Plans on the days that they coach class. This allows them to evaluate and tweak their plans as necessary before publishing to Project Roots. While the average WOD Plan that they write does not require changes, they do go back and make necessary improvements or modifications. Most affiliates know this effect: the 5A class doesn’t always “look” like the 5PM class. Inevitably, there may be small modifications to be optimize the session. This often happens organically between coaches, but we codify the changes before pushing the product to Project Roots. Prior to the WOD Plans being uploaded to Project Roots, they go through a rigorous copy editing, grammar, and formatting process. I believe coach familiarity with the WOD Plan’s consistent formatting helps coaches digest and learn the WOD Plan, ideally in 15 minutes, before they teach their first class. Project Roots programming and WOD Plans are delivered to affiliates such that they don’t have to upload programming on their own. This process is the final step in the 60 hours of planning! What is also not documented above is the countless amount of communications and discussions that go on among the team. Internal feedback on programming, WOD plans, Skill Work, the benchmark series, etc., between classes, at coaches meetings, in emails, all with the goal of ensuring the best possible single class experience while enabling long-term progression and development. At the end of the month, the staff at CrossFit Roots puts forth at least 60 hours of work to deliver the degree of quality we want for our affiliate and our members. Ultimately, Project Roots is simply the result of allowing other affiliates to use our system to their benefit. Great programming, effective class experience, all while allowing the affiliate that time to focus on other needs like developing their own coaching skills, or gym maintenance needs, or running nutrition challenges, or any of the other myriad of responsibilities an affiliate owner faces. Why not leverage Project Roots to get your Sundays back?